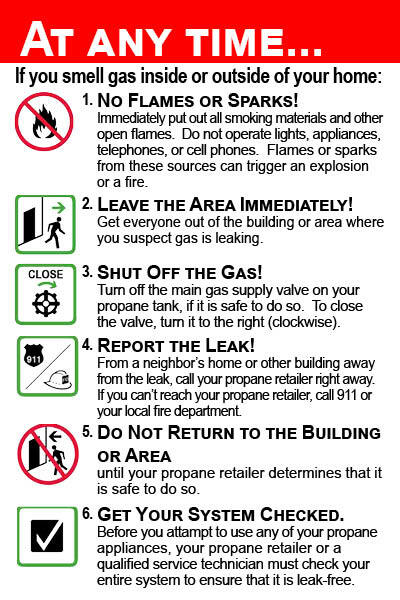 If you’re leaving your home for an extended period, consider closing all propane supply valves. This includes the main gas supply valve on the propane tank as well as gas supply valves located near individual appliances. WHEN YOU RETURN to your home after an extended absence, contact your propane retailer or a qualified service technician to conduct a leak check before the propane is turned on and to re-light the pilot lights. Click the links below to see more about each specific topic. BE SURE YOUR APPLIANCES CAN “BREATHE” PROPERLY. Regularly check the vents of your appliances to be sure that flue gases can flow easily to the outdoors. Insects, birds, and small animals sometimes build nests in vent pipes. Other obstructions such as snow or ice may also occur. If you see evidence of this, call a qualified service technician. Also, clear the area around your appliance to be sure plenty of air can reach the burner for proper combustion. Note: Not all propane appliances require venting. Vapors from flammable products such as gasoline, kerosene, paint thinner, and solvents, can be ignited accidentally by the pilot light of a propane appliance. Flammable vapors are often heavier than air and may travel along the ground and collect in low or confined areas (such as a basement or pit). Sometimes the vapors may follow air currents in the building to higher levels. Any source of ignition in these areas (such as a pilot light, spark, heater element, or electric motor) could cause an explosion or a fire.